A few years back, CBS’ 60 Minutes aired a feature on certain questions surrounding the death of Vincent van Gogh (tap or click to view an excerpt.) Did the painter commit suicide as is typically promoted? Did teen-aged boys with a “malfunctioning gun” wound him the afternoon of July 27, 1890—boys he may have gone drinking with? Was someone else in the wheat fields that day he left the Inn after breakfast ostensibly to paint? No matter how it happened, van Gogh passed away from his wound at about 1:00 am LMT according to contemporary accounts (with 1:30 am listed on his death certificate) on July 29, 1890 in his room at Auvers sur Oise, France with brother Theo among those at his bedside. The horoscope I’m posting here is set for that date and place at 1:19 am LMT because a YOD pattern formed at that time, a planetary pattern which has a health implication along with its ‘crossroads’ and ‘turning point’ connotations. The transiting Moon @25Sag53 (or, ‘death Moon’, tragically) had just set at 1:19 am along with the Lunar South Node, a Saturnian point of separation. As you know, the Moon is a significator for the physical body, among other things, and as such relates to health matters on both the physical and psychological levels. Ebertin gives the Moon-MC duo as “collapse” and as you see in the horoscope, their sextile forms the base of the YOD pointing toward Chiron, the wound and the wounded, in Cancer, ruled by the Moon. Transiting Chiron has crossed Vincent’s natal Ascendant recently and remains within orb; Cancer rules the breast and chest area where the bullet pierced his body and a turning point (YOD) has occurred. Van Gogh was born on March 30, 1853 with natal Moon @20Sag55 conjoining South Node (SN @22Sag28 Stationary) and Jupiter (24:16) and his last Lunar Return took place on July 28 while he was in bed and fading away toward death. A Moon-Jupiter conjunction tends to provide a good reputation yet Moon-SN has ‘bad timing, emotional isolation, and lack of cooperation from others’ implications of a karmic nature; Jupiter-SN denotes more ‘bad timing’ issues which blocked or restricted his endeavors along with ‘conflicts of interests’; Van Gogh’s ethical and religious aims may have clashed with prevailing social trends. Sadly, ‘coming down to earth’ may refer to multiple things in van Gogh’s case such as sinking to the ground after a gunshot–self-inflicted, misdirected, or accidental–and to his burial on July 30, 1890. His long term depressive condition may also be implicated along with his recent stay in the gloomy environment of an asylum (St. Pol—like Pollux! ), then on to Auvers where he is said to have completed 70 canvases in 70 days! Health wise, epilepsy plagued him as indicated in the natal chart by a particular midpoint picture: Uranus-Neptune = Sun (vitality): epilepsy and possibly migraines as well. (Ebertin.) Other natal chart factors also indicate neurological problems, disturbing dreams, plus, an inferiority complex, a fluctuating lack of incentive to work, a quarreling nature, and a weak will to live. July 29, 1890 1:19 am LMT Auvers sur Oise, France; Hour of an unaspected Venus (in 4th house and in Virgo, sign of the bowels and The Virgin); asteroid Aesculapia, a health/healer archetype, rises with the North Node (encounters; destiny) and the prior Solar Eclipse (PE), as noted above, making its themes of immediate importance; Moon is angular. Warrior Mars, fiery planet of guns, bullets, sharp instruments and those who wield them, is posited @1Sag49 in the 6th house of Health, Work, Daily Rounds, and Service including the military. Curiously, the degree of Mars at ‘1 Sag’ in the Sabian Symbols = “A Grand Army of the Republic Campfire” which I assume has nothing to do with the identity of the shooter–van Gogh himself or another–but one wonders. ‘Misdirected energy’ is found in the horoscope (ex: T-Square with Mars-Neptune pointing toward Saturn) with the Mars-Neptune opposition showing potential for deceptive actions, confused motivations, possibly fraud, and weakened efforts. Some sources mention the teen aged boys as noted above having a ‘misfiring gun’. Would a man wishing to commit suicide shoot himself between stomach and heart as van Gogh’s wound is described by those present at his deathbed? A painter familiar with human anatomy? Well, if he did shoot himself, there is a Kite configuration (if the Nodal axis is allowed) indicating success with the Moon as nose and NN/ASC as the tail. Separation (SN) from the physical body (Moon) was achieved yet a less painful method than a lingering death would surely have been preferred. Besides, did he take a gun with him that morning as he set out for the wheat fields for a day of painting? So far, I’ve found no mention of such planning on van Gogh’s part. As for the boys who may have been involved, the wounded van Gogh is reported to have stated, “Do not accuse anyone…it is I who wanted to kill myself” though in his letters he had referred to the act of suicide as “sinful” and “immoral” (as it is) and was known to be concerned with his spiritual condition and ultimate destination. If the shooting was accidental he may have wanted to spare someone the blame, make his death matters easier for his family, and gain positive karmic progress simultaneously. And yes, van Gogh’s occult interests are also known and he left behind a number of books on such topics. 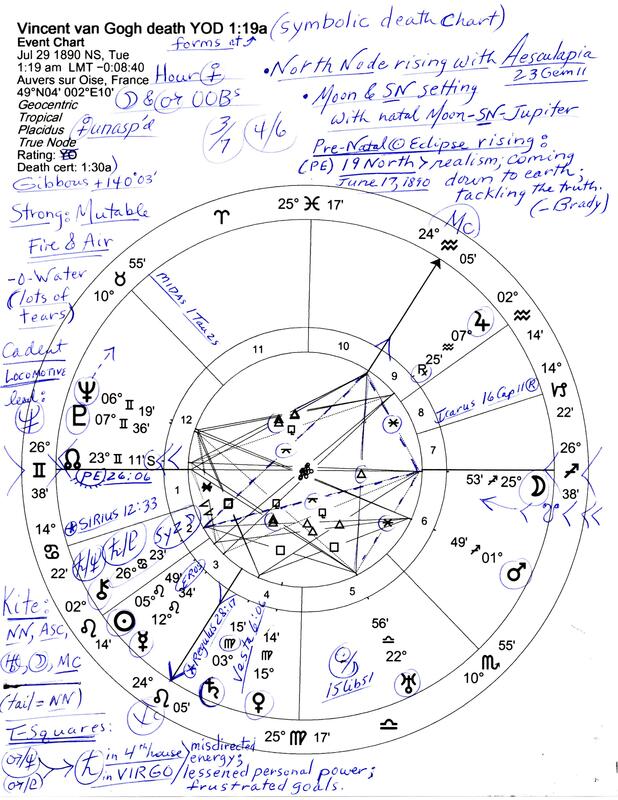 Other chart indicators point toward suicide and/or murder but with no definite conclusion: his natal Mars @26Pis08 (conjunct natal MC, the Aspiration-Career Point–in creative Pisces) conjoins Fixed Star, Scheat which can bring extreme misfortune, murder, or suicide (Robson) when linked to malevolent planets as here–conjunct quarreling Mars. 4. Acumen, a nebula star with Aculeus, both linked to the concept of blindness whether physical, mental, and/or spiritual. Was he color blind? Acumen implies the negative shadow side of the starry duo and brings attacks which weaken and damage. This star adds more of the light vs dark theme to van Gogh’s life and indicates problems with gossip that destroys the reputation. However, lashing out in anger–like a stinging scorpion–is inadvisable since it may result in self-destruction. Dealing with issues such as personal weaknesses and other problems “in the clear light of day” (ex: painting wheat fields!) is imperative for lessening the negative potentials of Acumen which links to his Moon-SN-Jupiter conjunction of bad timing, separations, and grief. But unfortunately, van Gogh’s natal Mercury-Pluto conjunction of deep thinking includes a tendency toward lashing out with cruel words that leave lasting damage to its recipients and to his relationships with them. Brother Theo van Gogh, a Paris art dealer who supported Vincent financially and emotionally, had been experiencing career disagreements with his employer and was considering starting his own company. By July 1890 this may have contributed to Vincent’s increased anxiety during his final days during which Theo attested to Vincent’s weak will to live: “He himself wanted to die.” Does such a desire prove that the shot that day was self-inflicted? Or did Vincent simply realize that the unremoveable bullet was an opportunity to escape all his suffering? His “La tristesse durera toujours” translates as, “The sadness will last forever,” and with this observation, when considering his difficult life fighting inner demons with lessening strength and his remarkable genius cut short, many art lovers would agree that Vincent van Gogh was correct. As for Canopus the Star, ancient cultures have various associations with what could be considered a ‘Royal’ star. In the Zodiac, Canopus is located in mid-Cancer (near Sirius–and US natal Sun) and is the Alpha star of constellation Argo the Boat (renamed Carina) from the ancient Jason and the Golden Fleece myth. Said to be of a Jupiter-Saturn nature when affecting a horoscope (both planets link to royalty and fatherhood), Canopus denotes pathfinders, leaders, and those who take long journeys perhaps with a Golden Fleece as a goal. Yes, the Hero’s Journey is indicated–in particular when long sea voyages are taken, plus, film actors and writers often have creative Canopus linked to their natal planets. Pablo Picasso was born with Venus (art) connected to Canopus for natal Venus was rising as Canopus culminated at Midheaven, the Career/Goal Point of a horoscope. Yet there is a dark side to Canopus–the ‘dark father’ who eventually consumes his children, a Chronos-Saturn theme. In line with this is that in some cultures, Canopus was known as ‘Heavy-Weighing Canopus’, the weight at the end of the plumb line that defined the poles of the Earth. Canopus, thought to be the Point of Stillness in the South, was noticed to move as the plumb line was knocked off-kilter and thus is associated with precession. Some North American tribes considered the northward movement of this southern pole star as a timer for the end of the world and called Canopus the ‘Spirit Star’ or ‘Death Star’. As such, Canopus is closely linked to the concept of Time, a province in Astrology of Saturn, the Timekeeper (‘Father Time’), Grim Reaper, and, in Psychological Astrology, the senex, or, old man. And in our horoscopes? The nemesis of Canopus, if linked to a planet or planets in your chart, is: “needing too much control” which, in the end, tends to damage what has been created or achieved. *Note that US natal Sun (July 4, 1776–the president) is located at 14 Cancer and “needing too much control” may be precisely the problem shown by the Justice Department’s tapping of AP communications, surveillance which allegedly was not ordered by the White House to find a Neptunian leak. It didn’t have to be ordered, it could have been a “whatever you have to do, find the leak” imperative–you know how presidents do. Then there’s the IRS ‘scandal’ (which may have been purposefully set up by –?–) and Canopus ‘tends to damage what has been created or achieved’. Unfortunately for the American people, the damage seems at this point to be the very foundation of our country’s now-eroding values of freedom and the right to privacy. Born with a Pisces Moon myself, I was interested to read expert astrologer Mary Plumb’s take on the abundance of Pisces energy all around us this February into March. Even Pope Benedict’s resignation is denoted with Pisces the Fish an ancient symbol of Christianity. The horoscope for his official resignation (February 28, 2013 at 8:00 pm Rome Time) shows Venus and Neptune (sub-ruler of Pisces and god of the Seas) joined together upon Royal Star Fomalhaut @4Pisces. As a pair, Venus-Neptune describes the Catholic Church with its worship of Mary (Venus) and its mystical (Neptune) rituals and masses, and Fomalhaut’s themes include mysticism, magic, and the occult, but also inherited illness and congenital effects. As you know, the Pope cites ill health as the reason for his step-down. Another Mary, Mary Plumb’s article Pisces Takes Over details the oceanic line-up of planets with the Moon on March 9th and the implications of this Jupiter-Neptune energy along with info on when planets are viewable in the night or early morning sky. Plus, we’re hearing an increase in news events related to Pisces such as oceans, ships, water, fishing, oil and gas, dancing, footwear, negative escapism like alcohol and other drugs…well, here’s a good example–the cruise ship stuck in the Gulf of Mexico which is being tugged to shore–landfall sometime this evening. And naturally a mention of the Piscean habits of secrecy, deception, and confusion is in order, right? Will May 2012 Eclipse bring US-Iran conflict? It is reported that the US sees May 2012 as the month to attack Iran which makes this astrologer wonder if the May 20, 2012 Solar Eclipse @ 00Gem21 may herald such an obscene and over-reaching event, a bad decision which may top All Bad Decisions. The May 2012 Solar Eclipse triggers a difficult Fixed Star Alcyone 00Gem00 with keyphrases: something to cry about; exile; sorrow and suffering–Alcyone is one of the Seven Weeping Sisters and relates to vision or lack of it–and since the Pentagon has an inperial habit of opening Pandora’s Box even though its unintended consequences and ills spill out upon all Mankind–if indeed the consequences of war are ever ‘unintended’ by the old men who start them for young men and women to fight–then this Solar Eclipse may be a potent influence. Click the eclipse link above for a view of the May 20, 2012 Solar Eclipse horoscope set for Washington DC along with a few chart details written by this particular dissenting American of a peaceful disposition. In Campaign 2012 news, have the Republicans “sealed their fate” with Hispanic voters as the Obama camp suggests? And check out today’s astro-peek concerning Monday January 30, 2012 from Robin Hood to Beaujolais at Stars Over Washington, as you wish. Dec 16 2011 Comet Lovejoy survives its solar plunge! Well, apparently today the US Congress acted in time to avoid a shutdown of the US government tonight at midnight so that we the people can avoid being extinguished for a while longer–we survived our own ‘solar plunge’ in spite of the massives egos operating and battling for control on Capitol Hill. Consider Fixed Star Denebola, now @ 22Virgo: keywords: ‘to go against society; against the mainstream’ which seems to me to be just what politicians are conspiring to do when they fiddle faddle around and neglect the creation of employment opportunities and programs that could put Americans back to work and which would help boost the US economy. Instead we get such frothiness as light bulb efficiency regulations and reaffirmation of our national motto even though it was reaffirmed as recently as 2002. Yes, it’s time and dime wasting on Capitol Hill! And of course, transit Neptune @ 28AQ is still within orb of US natal Moon (we-the-people) which brought us floods, fraud, and home foreclosures with the resulting homelessness, sense of rootlessness, and loss. Besides, any chart with Neptune rising describes unstable and/or deceptive conditions so with a rising spiritual, idealistic, and inspired yet confused Neptune, planet of fraud, dissolution, oil-gas-water, and poisons, I hope the megabus bill passed today doesn’t have what’s called “poison pills” hidden secretly in Neptunian fashion within its 2,300 pages. And with President Obama’s natal Mars (motivation; desire nature; energy ;action principle) veiled by US natal Neptune, can we depend on Mr. Obama to veto what the majority of us don’t want such as indefinite detention? Doubtful–also a Neptunian word. SUNGRAZING COMET SURVIVES: Sungrazing Comet Lovejoy has confounded the experts and survived its close encounter with the sun. Last night, NASA’s Solar Dynamics Observatory recorded amazing movies of the comet entering and exiting the sun’s atmosphere. Comet Lovejoy’s scorched remnant is now receding from the sun in full view of the Solar and Heliospheric Observatory. Visit SpaceWeather.com for the latest movies and discussion. If you’re not overly wary of Political Astrology, you may wish to check out my freshly updated blog Stars Over Washington, or, for briefer posts and what could be groanworthy verses, I promise to tell nary a soul if you simply mosey on silent paws to Woolly Mammoth Chronicles while no one is looking! Welcome Home to All US Soldiers! For backyard stargazers, the next few nights are the best time to see green Comet 103P/Hartley 2 as it approaches Earth for an 11-million-mile close encounter on Oct 20. Set your alarm for the dark hours before dawn, go outside, and look straight up. You will find Hartley 2 not far from the bright star Capella. Although the comet is barely visible to the unaided eye, it is easy to locate using binoculars and looks great through a backyard telescope. Sky maps and more information may be found at SpaceWeather News. Lovely Capella! Alpha Auriga in the constellation of The Charioteer, this Fixed Star has a nurturing yet free-spirited flavor and is associated with the ‘fertile goddess’ archetype which links to the horse by way of Macha, the great Celtic horse goddess. She embodies movement and action and is connected by paran to the natal chart of aviatrix Amelia Earhart. Airplanes may be said to be modern-day ‘chariots’ and with Capella associated with Earhart’s natal Venus, she is seen as a woman (Venus) breaking speed records, and was known for her love of the freedom of flight. Other Capella-linked examples are astronaut John Glenn (Saturn) and comic book hero Superman who was created with his Mars rising with Capella! With Capella there is need for freedom and independence, and must I say it? A need for speed. Oct 9, 1604: Kepler’s Supernova 1st seen! Today isn’t only the 70th birthday of John Lennon. October 9 also marks 406 years since Supernova 1604 was first spotted in the Milky Way. German astronomer (and astrologer) Johannes Kepler first spied it himself on October 17 yet October 9 is the official anniversary of the star’s very first sighting in the constellation Ophiuchus. Whether the 8-day difference in the dates is due to the historic calendar change from Julian to Gregorian, I’m not certain. Perhaps so. Suffice it to say, it’s been a while since ‘Kepler’s Star’ or ‘Kepler’s Supernova’ came into human consciousness. His book on the celestial discovery, De Stella nova in pede Serpentarii may be translated as, On the New Star in Ophiuchus’ Foot. The stars of Ophiuchus the Serpent Holder and Serpens the Serpent are now spread between three constellations: Ophiuchus the Serpent Holder, Caput Serpens, and Cauda Serpens. Ophiuchus occupies a larger area across the ecliptic than the modern constellation Scorpio. From November 21 to December 16, the Sun is actually among the stars of Ophiuchus rather than in Scorpio yet most modern astrologers make no differentiation in this matter. Debates continue. To the Greeks, Ophiuchus was known as Serpentarius the Healer which points to snakes shedding their skins, an archetypal symbol of new life. Serpentarius was also known as the god Asclepius, son of Apollo, the Sun god; in Astrology, the Sun represents our vitality. Asclepius was taught the healing arts from Chiron and is usually depicted holding a stick about which a serpent is coiled, a modern day motiff of Western medicine. You, of course, note the Scriptural similarities with the uplifted coiled serpent along with modern Astrology’s use of Chiron as an archetype of Christ, the Key, and Healer of all our woes. Legend says that Asclepius was ship’s surgeon on the Argo and the story goes that his skills improved until he could raise people from the dead so the gods, always jealous of their exalted dominion, smote him with one of Zeus-Jove’s thunderbolts and placed him in the heavens as Ophiuchus. Then in 1604, the excellent Johannes Kepler came along with his telescope, bright intelligence, knowledge, and what must have been rather good eyesight…and the rest, as they say, is history. Considering that today’s starry anniversary falls upon a certain Beatle’s birthday, it’s interesting that John Lennon’s natal Venus culminated as Ras Alhague rose. Abraham Lincoln is another historical Ras Alhague figure with the star linked by paran to his natal Mercury. If it isn’t in your library of very interesting books, you may wish to check out Brady’s Book of Fixed Stars on Amazon where you may notice a novice’s review I wrote about the book years ago!